This section pulls together some memories from five years spent living and working in Dumfries and Galloway, the region of Southwest Scotland this is bypassed by most visitors who head straight for Edinburgh, Glasgow and the Highlands beyond. It's a vast area, extending about 100 miles (160 km) from Portpatrick and Stranraer on the Rinns of Galloway, east to Langholm in the Scottish Borders. There are numerous walks along the coast, hikes over high hills, routes through the countryside, and trails close to the small towns and villages. And away from the two busy routes from Gretna - the A75 west to Stranraer and the M74 north to Glasgow - the roads are quiet and the countryside offers real peace and relaxation. 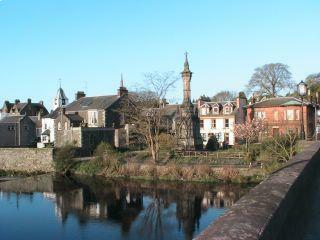 The main town is Dumfries, 25 miles west of the border at Gretna, with other smaller towns spread across the region: Annan, Dalbeattie, Castle Douglas, Kirkcudbright, Gatehouse of Fleet, Newton Stewart, Wigtown, Stranraer and Portpatrick close to the Solway coast, and Thornhill, Sanquhar and Kirkconnel on the A76 route north from Dumfries. Many of the towns and villages, and fascinating historic attractions, are linked by the Solway Coast Heritage Trail, which is signed for 190 miles along the coast from the M74 at Gretna. I remember the discussions to set this up, back in the mid-1980s, when I was responsible for tourism in Dumfries and Galloway. We debated what would be the right name and logo, with "Magical History Tour" being one possibility. It seems to have stood the test of time, providing an excellent route to explore the attractions of the coastline, with many walking possibilities along the way. The rest of this page captures other recollections from that time, 1986-1991, and some of the walks which we enjoyed. I don't have digital photos apart from a few taken on a recent return to Newton Stewart when we stayed at the Creebridge House Hotel (an old haunt from the past and a very comfortable place to stay if you're planning to visit the area). However I intend to scan in a few of the old slides when time permits, and hope to go back down there soon to discover some of the walks that I've missed. If you have stories of specific walks you have enjoyed in Dumfries and Galloway, or photos you'd be happy to share, please send them in, and links will be added from this page. 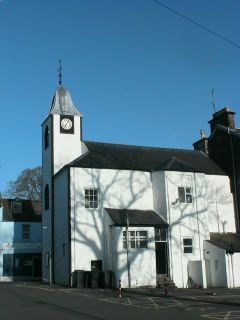 We lived for two years in Newton Stewart, in the heart of Galloway, before moving east to the regional centre of Dumfries. This meant we were able to explore the countryside of most of Dumfries and Galloway during weekends and when friends and family visited for holidays. With two young children, we didn't go hiking much in the higher hills, but we did manage the long steady climb up Cairnsmore of Fleet (711m) - the rounded hill which overlooks the A75 between Creetown and Newton Stewart. The first section from Kirroughtree was up through forest plantations, but then it became open hillside (and rather windy). More frequently we enjoyed the marked walks in the Kirroughtree Forest, just east of Newton Stewart, or the Fleet Oakwoods from the centre of the conservation village of Gatehouse of Fleet. From some of the higher points along the road here, and at the fascinating ancient burial site of Cairnholy, you can see the Isle of Man in the distance on a clear day. A couple of friends came to visit from Birmingham, and enjoyed a relaxing walk with us through the Wood of Cree. 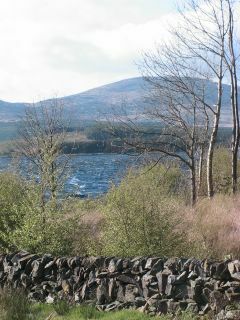 This is another secluded place for a short walk, on the back road from Newton Stewart north to Glen Trool. It's a remnant of the natural oak woods that used to cover much of the landscape, now maintained as a bird sanctuary. 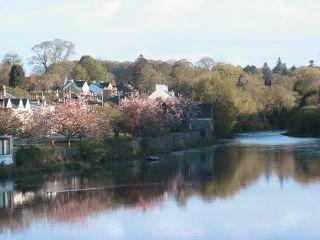 I also remember a lovely walk with other members of the family when they spent a week in a cottage near Creetown. We walked along the coastal paths at Rockcliffe, south of Dalbeattie, and enjoyed a meal at a pub in Kippford looking out at the boats moored in the bay. This walk was one of several featured in a book of "Bird Walks" highlighting the possibilities for ornithology. On another day, we had a great (not too long) climb up through forest to the rocky summit of Screel Hill near Dalbeattie, with a great view over the coast. When we came down we visited the unusual and picturesque Orchardton Tower nearby, built in cylindrical shape unlike the many other square towers elsewhere in the region. From Dumfries, there were good forest walks nearby at Mabie Forest (together with mountain bike trails) , and I also took part one year in a hill race up Criffel (569m) which overlooks the Nith Estuary. I remember thinking it would be better as a hill walk as we hurtled back down to the village of New Abbey, dominated by the remains of Sweetheart Abbey - best known of several ruined abbeys to be seen locally. If I'd had time to take in the hilltop view, I should have been able to see the Lake District mountains across the Solway Firth. We also made several visits to Drumlanrig Castle, north of Dumfries just off the A76, where we could enjoy walks around the formal gardens and the woodland trails as well as touring the castle and craft centre. I remember we also had our first experience of using mountain bikes on a serious biking trail here - exhilarating but sore! There are other cycling memories - the bicycle was invented by a blacksmith, Kirkpatrick Macmillan, at Courthill smithy close to Drumlanrig in 1839, and I was involved with others in a big festival to mark the 150th anniversary. It gained us some good publicity for Dumfries and Galloway! The highest hills of the Galloway Forest Park fall just short of 3000 ft, and this has meant they are not sought out by enthusiastic Munro-baggers. I only really had one proper climb to the top of the Merrick (843m), covered under the photographic memories section below, and Cairnsmore, mentioned above. The Galloway Forest Park is serious wilderness hill country, and has played host to the Karrimor Mountain Marathon more than once (they seem to have been pretty unlucky with the weather - when it rains down here, it can be VERY wet). The granite rocks don't drain very well, and there are plenty of lochans and boggy areas to try and avoid as you explore the remoter hilltops. A booklet on "The Galloway Hills: A Walker's Paradise", drawing together walks by George Brittain published in the Galloway Gazette in 1988, lists 45 hills of 2000 feet and over. Their names conjur up forbidding images of remote and rugged landscapes, and fearsome legends: Black Shoulder, Craignaw, Red Gairy, Meikle Craigtarson, and Trostan. Even more so the three main groups of hills in the Forest Park: Awful Hand, Dungeon Range, and Kells Range. Quite unlike the familiar Bens, Mealls and Sgurrs of Highland mountains. So, this is a great place for exploring some wild scenery, but take care, as there aren't many other walkers likely to wander by if you twist an ankle! Further east, beyond Galloway, the high hills are less intimidating, with sandstone rocks draining more freely and creating grassy rolling hilltops. Nevertheless, there are some dramatic deep gorges to be seen - notably the Mennock Pass leading from the A76 via the B797 up to Wanlockhead, famous as a lead-mining and gold-panning centre. It's high in the Lowther Hills, which rise to 2403 ft (over 700m) at Green Lowther. Further east again, and you're entering Border country with the high hills just north of Moffat. Several of these reach over 2600 ft (over 800m). Just before we moved from Dumfries, I remember a great day out hillwalking here with my old colleague from a neighbouring tourist board area. We climbed the steep grassy slopes of White Coomb (the highest at 2696 ft) and Hart Fell, but then my companion had problems with his knees, and descended most of the way on his back-side! In the valley below White Coomb is one of the scenic highlights of this part of Scotland - the Grey Mare's Tail waterfall - not far off the road. As at Mennock, you can see some more really dramatic scenery from the roadside if you take the A701 road from Moffat north towards Edinburgh. It climbs steadily up the side of the valley to the head of the Devil's Beeftub, which is as impressive as its name - a great bowl of rock, heather and grass with steep slopes falling 1000 feet down into the valley below, where miniscule sheep are grazing. The Southern Upland Way stretches for 212 miles from Portpatrick overlooking the Irish Sea, east to the Berwickshire coast, taking in all these upland areas and more in the Borders. It has never captured the attention gained by the West Highland Way, but continues to attract determined hikers keen to take on such a challenging route. During my time in tourism, we met regularly with our colleagues from the Borders, the local authorities, and the Countryside Commission for Scotland (predecessor to Scottish Natural Heritage) to discuss the development and promotion of this route, which had just been established in 1984. One of the objectives was to develop more circular routes using sections of the Southern Upland Way, where it passed close to settlements. You can walk sections of the Way at Portpatrick, New Luce, Glen Trool, St John's Town of Dalry, Sanquar, Wanlockhead, and Beattock. 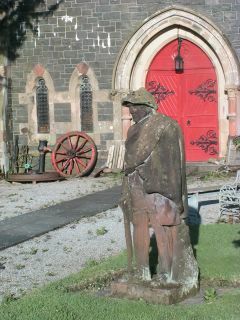 As well as castles and abbeys, Galloway is notable for the number and quality of gardens open to visitors. We made good use of our National Trust for Scotland membership, visiting Threave Gardens just outside Castle Douglas for relaxing walks at different times of the year. There was always something that the children would find interesting, and it was a safe environment for them to run around in. We also walked around the gardens further west at Castle Kennedy and Galloway House, which are both outstanding in the spring with their azaleas and rhododenrons. 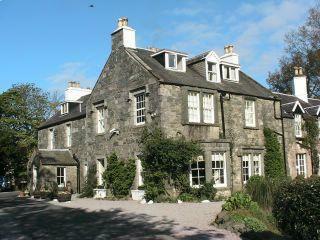 Galloway House has woodland walks including one down to the shore of Wigtown Bay. More unusual sub-tropical species could be seen at Logan Botanic Gardens, away down towards the Mull of Galloway - the most south-westerly point in Scotland. Sheltered from the wind by high walls, and benefiting from the mild climate, it has palm trees and those weird gunnera manicata spiny rhubarb plants. Strolling round the gardens, you could easily imagine yourself to be thousands of miles away. I took lots of photos for my work, and different members of the family appeared in a variety of tourist brochures over the years! Three particular instances stand out. In the early summer of 1987, friends of ours came down from Aberdeen for a week's holiday, staying in a cottage nearby. One day when it had been raining all morning, it cleared up in the afternoon, and I called Malcolm after work to see if he wanted to go walking in the evening sunshine. We ended up climbing The Merrick from Bruce's Stone in Glen Trool (the usual route) and getting some really magnificent views over the rugged and waterlogged Galloway mountains with the sun casting sharp shadows. These dozen or so photos were used in lots of Dumfries and Galloway Tourist Board brochures and other walking publications over the next few years. Later that year, I had a call from the photographer for the Scottish Tourist Board to say he wanted to get some pictures of the Galloway Hills to use in their publications, and this was a great opportunity to raise the profile of walking in the Galloway Forest Park. I spoke with Paul beforehand and he explained that he needed a male model to accompany his girlfriend in the photos! I managed to persuade a friend in Newton Stewart, Chris, to play the part on the Friday evening, whilst I had a go the following morning. It was brilliant weather, and Paul captured some great shots. Those with Chris in particular were excellent, and dominated the front of various walking brochures for Scotland in the late 1980s. I'm sure it was the quality of the light that resulted in a better set of photos! Chris received a bottle of whisky for his troubles, and quite a few comments from colleagues and family! The third little story was from a few years later, when we had moved to Ayrshire, and drove down again for the Galloway Marathon in Crossmichael. It must have been spring 1992. After a successful race, on the way back we called in to a roadside shop to buy some drinks, and I spotted a tourist brochure on the shelf. The front page was taken up by a photo of the rest of the family, taken 6 years earlier when the children were much smaller, enjoying a picnic in the Galloway Forest Park. An amusing moment to remind us of happy times spent in the region. In memory of Campbell Ferguson, a great walker and an old friend in Newton Stewart, with whom we enjoyed walks at Kirroughtree, Fleet Oakwoods, and elsewhere. He died, very sadly, in the spring of 2005.